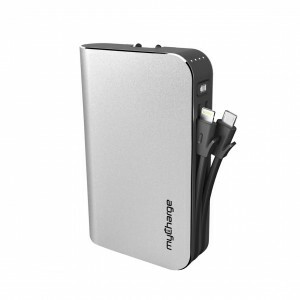 So, now we that we are in the process of reviewing a whole bunch of myCharge products, I’m going to review the HubMax. I don’t know if the HubMax is a sequel to the HubPlus, but that was a mobile battery that I took to CES and really was able to make full use of it. The HubMax is almost double the power at 10500 mAh (that’s up to 6x extra battery), and it has both the micro-USB and Lightning cables so you can charge two devices at once. This way, you don’t have to carry your charging cables around with you when you go places with both your iPhone and your Samsung…okay, maybe you have some other kind of micro-USB device that you need to charge. Oh, there is also an extra USB port, so I suppose that you could charge 3 devices at once. By the way, it recharges up to 50 percent faster than competitors. This is one of those great mobile batteries that plugs into the wall to charge, with a 3.4 A output. If you want to check this out for yourself, it can be purchased on the myCharge site for $99.99.